Visiting Armenia? The Caucasian country is full of scenic spots, but what really sets it apart are the beautiful monasteries in Armenia built on mountain tops or hidden within gorges. When reading through blogs and guidebooks in preparation for our trip to Georgia and Armenia, we were surprised to find that almost all recommended sites of interest seemed to include Armenian monasteries and churches. Not being religiously inclined ourselves (but coming from a country having more than one church per square kilometer), we were worried about the possibility of getting bored seeing so many churches, and a little hesitant about making the effort to locate some of the more inaccessible sites in beautiful Armenia. 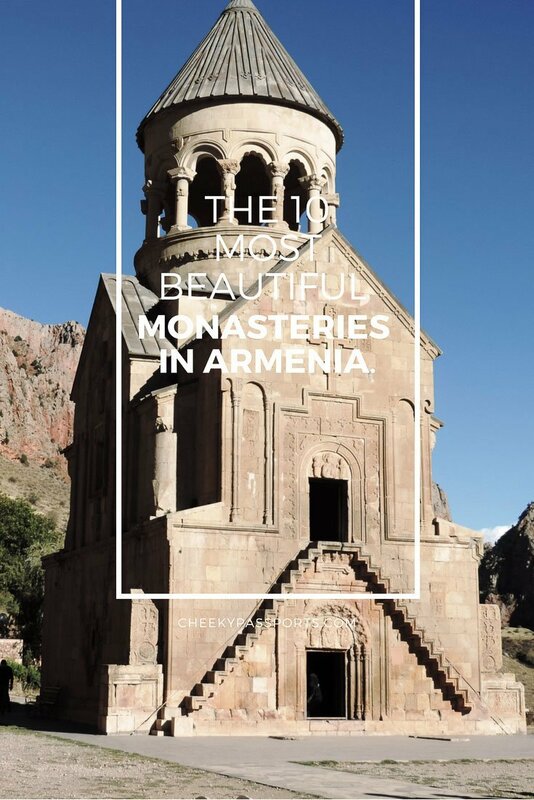 We quickly realised that there is nothing boring about Armenian monasteries and churches – from houses of worship with mysterious inscriptions to majestic monasteries built within remote mountains and canyons, their (sometimes) simple beauty and spectacular setting captivated our attention from the beginning to the end of our road trip across the country. Armenia’s national church, the Armenian Apostolic Church has been defined in the country’s constitution; Armenia was in fact the first country to adopt Christianity as its official religion. With about 95% of the population identifying as such, Armenian people hold a very strong relationship with their Church, evidenced in its influence on Armenian culture and the importance of monasteries in Armenia. Visiting every single monastery within the territory is a rather daunting task which was not within the scope of out trip, but we did manage quite a few! 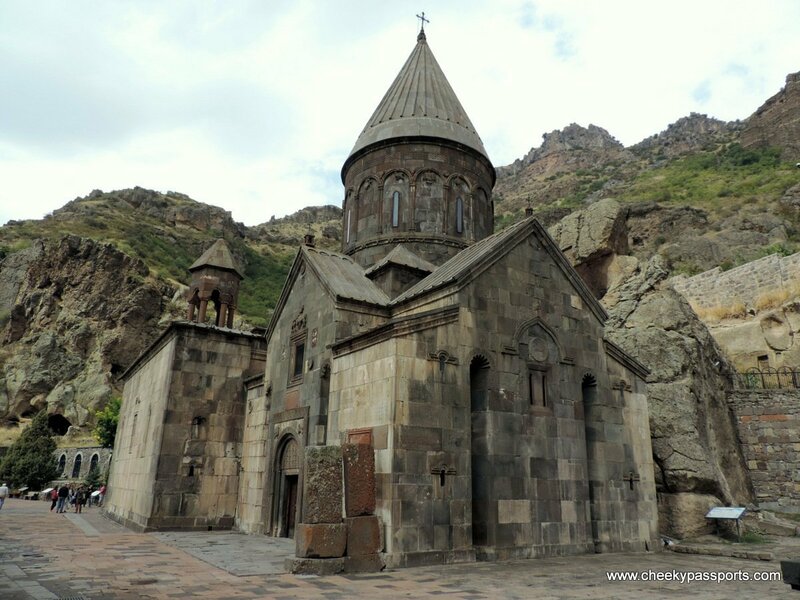 The UNESCO World Heritage Site by the name of Geghard, which literally translates to ‘spear’, is so called after the Holy Lance, the spear which pierced the side of Jesus Christ during his crucifixion. The monastery complex consists of various churches and chambers some of which are hewn into the cliff wall accessed via cave passageways. One of the chambers allows for some extraordinary acoustics which was demonstrated by a female choir, which on occasion grace the place, to the delight of the tourists exploring it. The eerie yet splendid voices gave a mystical feel to the whole experience and as I listened to them, I tried to imagine the monks living and worshipping inside these caves hundreds of years ago. This must have been, and still is, one of the exceptionally distinctive monasteries in Armenia! 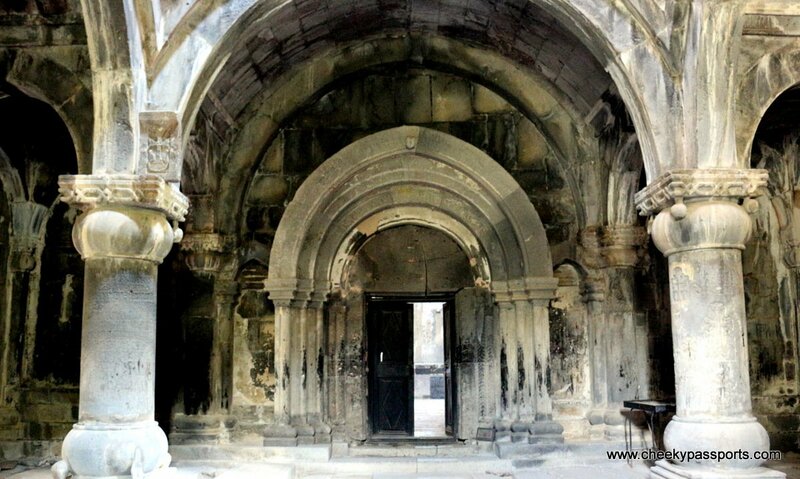 Tours to visit Geghard Monastery can be booked here. This gorgeous monastery sits at the edge of a cliff overlooking a deep canyon in the south of beautiful Armenia. Having started off as a pagan temple on the cliff, this was subsequently replaced by a church and then by the present monastery. The University of Tatev, one of the most important during the medieval period, was located within the monastery grounds during the 14th and 15th century and housed hundreds of monks as well as calligraphers, painters and philosophers. One of the more remote monasteries in Armenia, it is accessible via a winding narrow and (typically) badly-paved road up the cliff or alternatively by a trip on the Wings of Tatev, a cable-car that holds the Guinness World Record for the Longest non-stop double track cable car. If you’re driving up to the monastery, be sure to stop at the Devil’s Bridge, a natural rock formation surrounded by hot springs and mysterious caves. Alternatively you can visit the the bridge and then back track a couple of kilometers to the village of Halidzor where the cable car terminal is located if you would like to experience both (which is what we did). A beautifully restored olive-oil mill, built in the 17th century, is found adjacent to the monastery and is freely open to the public. Free wifi is available on site. Tours to visit Tatev Monastery can be booked here. 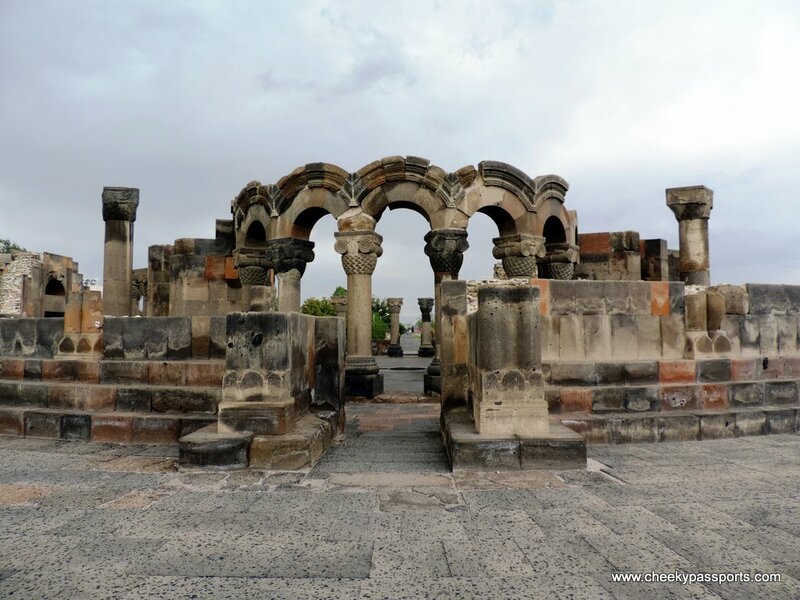 Garni is is the only non-Christian house of worship on this list having been built in honour of the Sun God before Armenia converted to Christianity in the fourth century. Built right at the edge of a canyon and surrounded by mountains, Garni’s spectacular backdrop and beautiful facade, makes it one of the most visited sites in Armenia. The temple was demolished in 1979 by an earthquake and reconstructed from the stones and debris that remained scattered throughout the site after the incident. It is located on the way to Geghard Monastery so you may wish to visit both on the same trip. 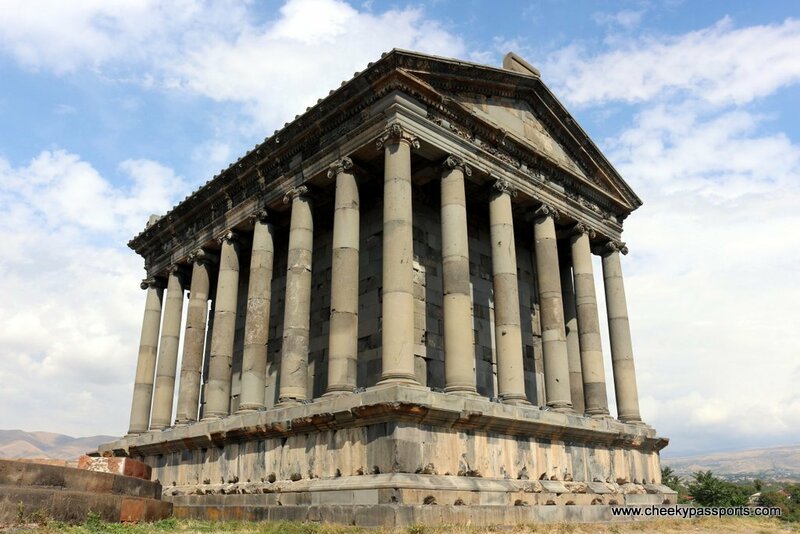 Tours to visit Garni Temple can be booked here. A 10th century monastery located in the Debed canyon which, together with the nearby monastery of Haghpat, is also a UNESCO World Heritage Site. Beautiful in its dark gloominess, with an almost neglected feel, this monastery contains several khachkars (engraved stones) and tombs, giving a very ‘Indiana Jones-y’ kind of feel. Watch out for the protruding paving stones within the dark interior! 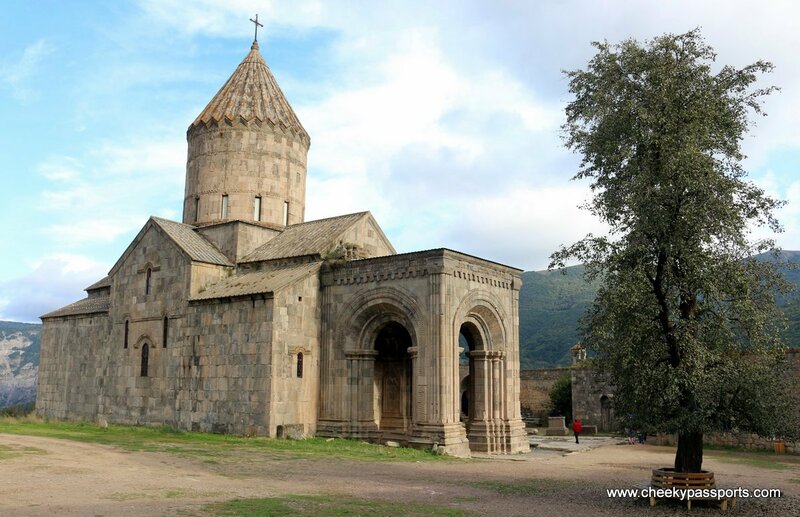 One of the most exciting monasteries in Armenia to visit! Tours to visit Sanahin Monastery can be booked here. 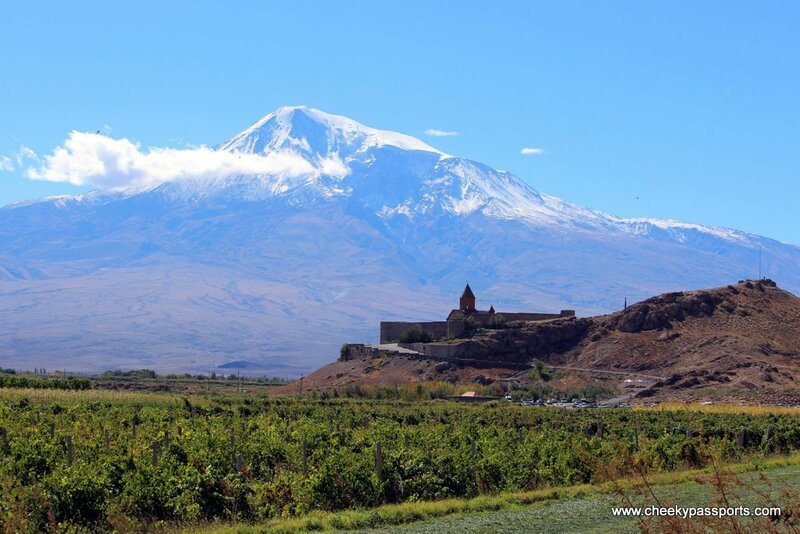 Located a few kilometers away from the border with Turkey, this is one of the most famous Armenian monasteries, popular for being an important pilgrimage site, but what captivated us most was the gorgeous setting within the rural village of Pokr Vedi with Mount Ararat as a backdrop. Often the subject of many guidebook cover photos, this is probably the one scene that is synonymous with monasteries in Armenia (or Armenia in general). We did in fact spend the majority of our time taking pictures of the monastery, as opposed to actually spending time inside. Having said that, the church contains a claustrophobic but interesting empty pit which can be accessed through two different openings, each having a long metal ladder. The pit was allegedly Gregory the Illuminator’s (a Christian preacher) prison for thirteen years, which he survived thanks to a local woman who secretly used to feed him. Tours to visit Khor Virap can be booked here. Being the mother church of the Armenian Apostolic Church, this is the most important religious site for Armenian Christians. The site grounds are large and the cathedral, said to be the oldest in the world, quite beautiful. Because we prefer quaint buildings rather than large churches, this was not one of our favourite sites however we included it here because of the UNESCO World heritage Site status and its importance to the Armenian people. It also holds the lance said to be that used during Jesus Christ’s crucifixion, previously held in the Geghard Monastery (see above). 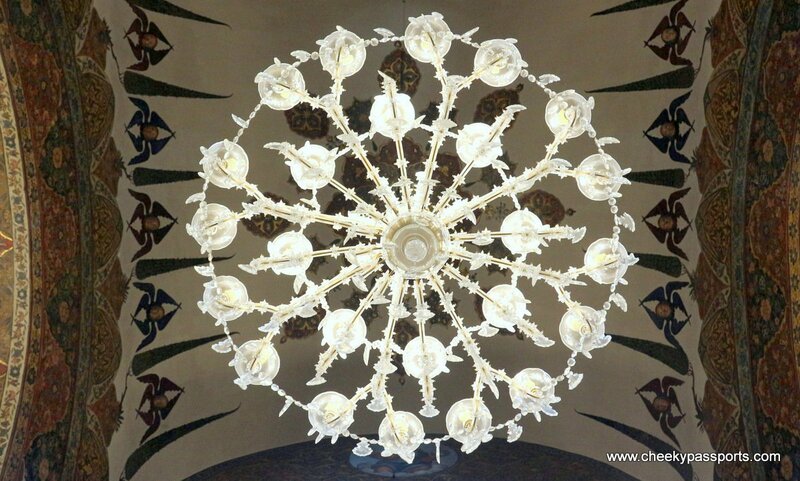 Tours to visit the Etchmiadzin Cathedral can be booked here. Set in a narrow gorge surrounded by red mountains, this is one of the most isolated and beautiful monasteries in Armenia. The Armenians certainly knew how to choose the the most gorgeous locations for building their monasteries! 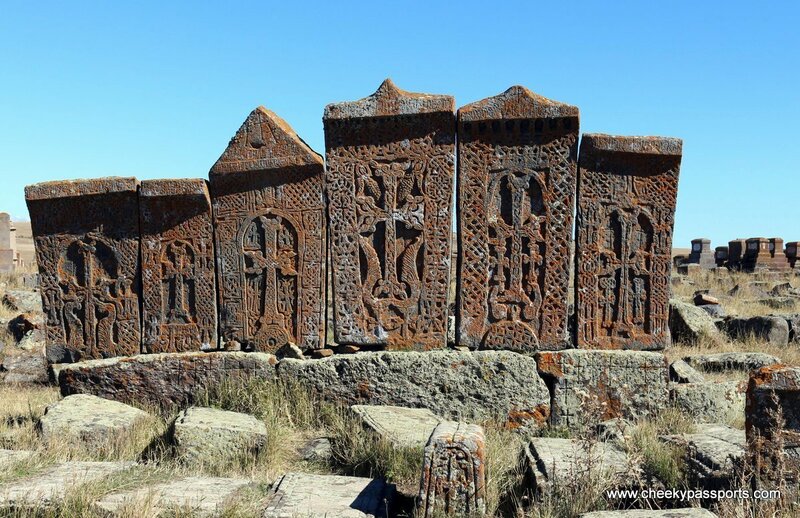 The 13th century site includes three churches each containing intricate stone carvings and also a number of interesting khachkars. You can climb up some steps to access the second level of the Surb Astvatsatsin Church but a word of warning – the steps are very narrow, quite high and there’s no railing to hold on to so it is very easy to fall off. Do not try climbing them if you suffer from vertigo! Tours to visit Noravank Monastery can be booked here. This is probably one of the most underrated monasteries in Armenia, which, initially when planning our trip, I was thinking of skipping in favour of the more popular Sevanavank. 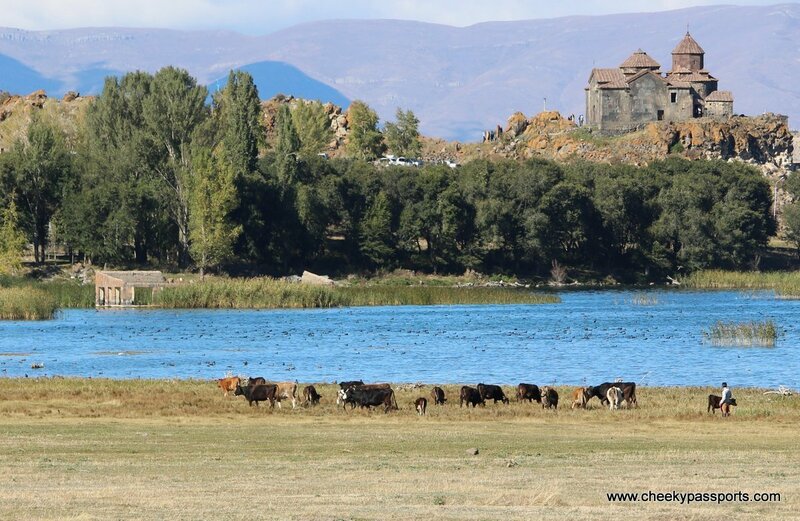 During the coastal drive along beautiful Armenia’s Lake Sevan however, the structure with its picturesque setting caught our eye, so we decided to make a short stop. We couldn’t access the church because it was closed for a wedding celebration but we could at least enjoy walking around the site inspecting the khachkars. 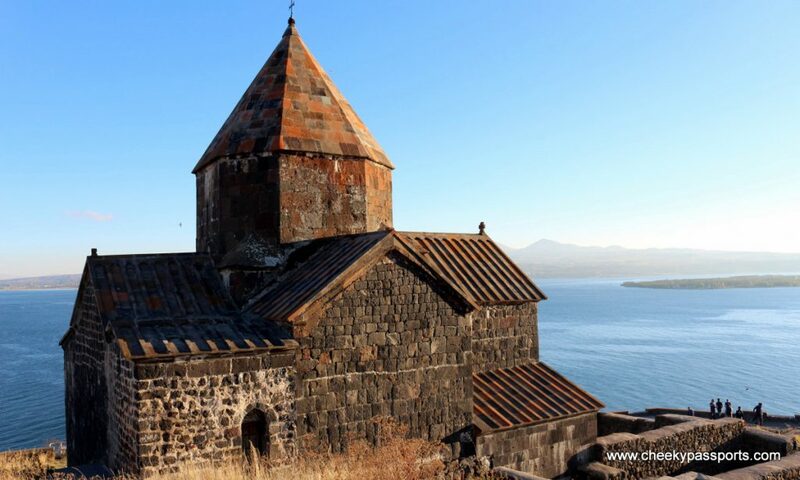 Small and simple, the church is surrounded by the lake and green fields where livestock graze, making it one of the most charming places to visit around Sevan. Tours to visit Hayravank Monastery can be booked here. Despite its name, Zvartnots cathedral is actually a 7th century Christian complex which already lay in ruins by the 10th century (but no cause as to why it was ruined is known). Also a UNESCO World Heritage Site, the temple provides a splendid view of Mount Ararat on clear day which is, unfortunately, quite rare. If you’re fan of ancient structures, this is a site that you will surely find interesting. Do not miss seeing the sun dial and the “phallus” stone located on the southern side of the temple which symbolises fertility – this was found during excavations and was considered sacred to ancient pagan worshippers. Tours to visit Zvartnots Cathedral can be booked here. 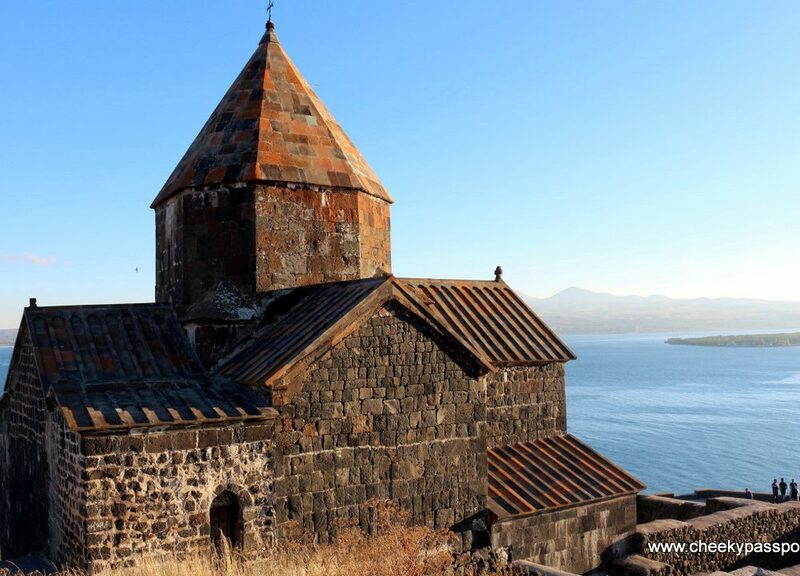 This complex, situated on a peninsula on the beautiful Lake Sevan, consists of two 9th century churches separated by a narrow path and is one of the more popular monasteries in Armenia. The site overlooks the lake and is indeed very scenic although rather noisy on a Saturday night since it somehow seemed to double up as a play area for kids at that time. 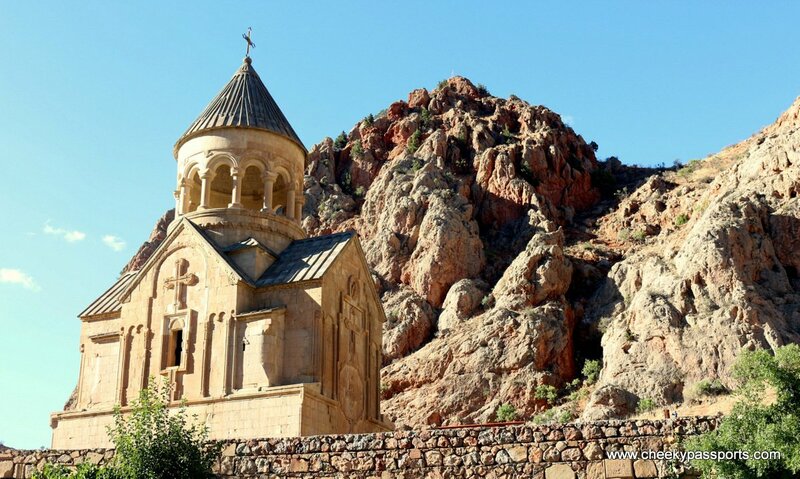 Tours to visit Sevanavank Monastery can be booked here. 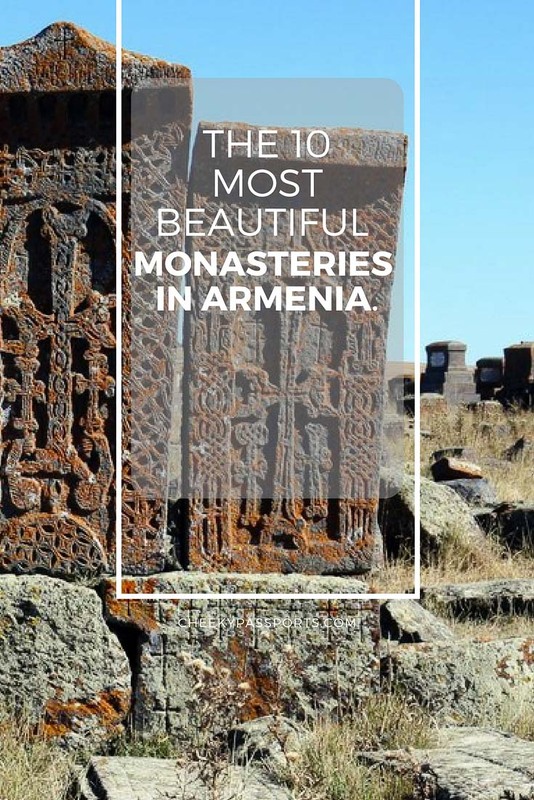 We hope that our list of Armenian monasteries have inspired you to visit beautiful Armenia and that you will love it as much as we did! Wow, these are lovely! As a Muslim, I love visiting churches as I find them very interesting, but monasteries are a bit more difficult to come by. Your pictures are beautiful! Thank you Nina 🙂 We love to find beautiful churches and monasteries too! Welcome. Enjoy Armenia, it is truly mesmerising! 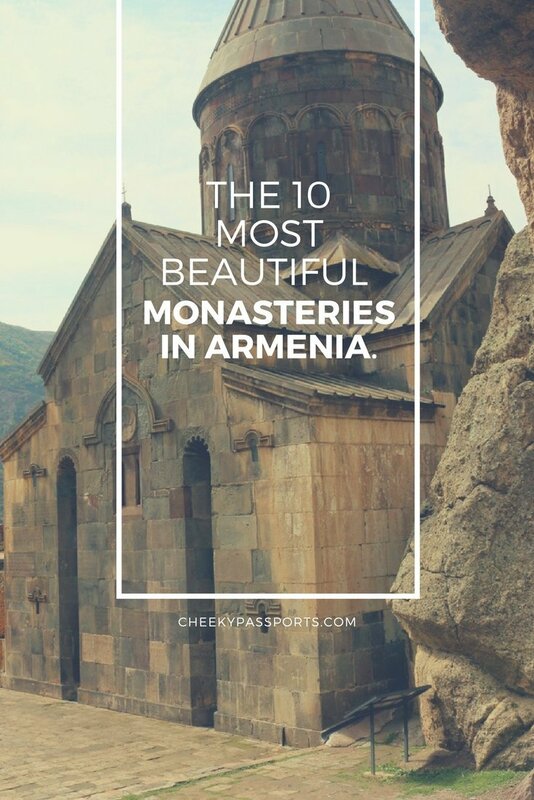 I’ve been to most of these monasteries when I went to Armenia twice. These places are simply amazing and unforgettable. I hope to be back again!